Homemade cornbread, pecans, herbs and mushrooms make the perfect stuffing mix for your next roast turkey or chicken dinner. No need to stuff a bird for this recipe. 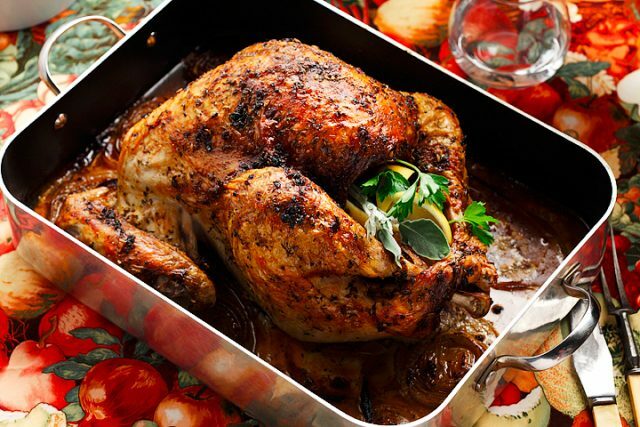 It is best when made in a baking pan which makes it perfect to also pair with roast turkey or chicken breasts or pieces. 2.Place cornbread cubes on a large baking sheet in a single layer. Bake for approximately 35-40 minutes, or until dried and nicely browned. Toss at least once while toasting. 3.Coarsely chop pecans. Set aside. 4.In a large sauce pan over medium high heat, add canola oil. Sauté onion and celery 4 to 5 minutes until softened. Add mushrooms, thyme and rosemary, and salt and pepper and toss with onion and celery. Cover pan and cook for about 3 – 4 minutes, until mushrooms are just beginning to soften. 5.Remove lid and stir in white wine. Let wine completely reduce, about 3 -4 minutes. 6. Add bread crumbs and pecans to vegetable mixture. Toss to combine. 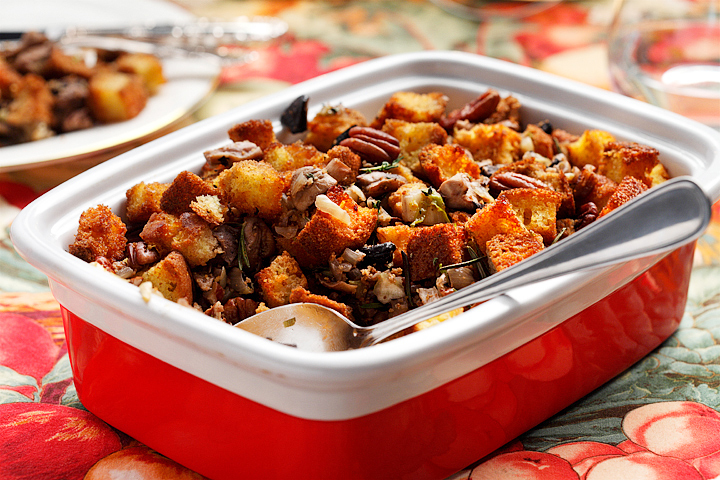 8.Transfer stuffing to a canola oil sprayed 9×13 inch baking dish or casserole dish. Bake at 300º F (150º C) for 35 – 40 minutes or until stuffing is nicely browned and cooked throughout. *Artisan bread can be substituted for cornbread. Use 1 loaf as the substitute and follow instructions below. 2. Spray 9 x 9 inch (23 cm x 23 cm) baking pan with canola oil. 3. In a large bowl, combine cornmeal, flours , sugar, baking powder and pepper. 4. In a medium bowl, combine milk, canola oil and egg. Add to flour mixture. Stir until just moistened. Pour into baking pan. 5. Bake for 20-25 minutes or until tested comes out clean.